These are frustrating times. The country is in crisis and elected "leaders" are not leading. The Tea Party is asserting significant pressure on Washington representatives to make knee jerk decisions to correct the many neglected issues in this country at the risk of creating calamity. The Tea Party has awakened the country to the serious fiscal problems it is facing. However, Instead of throwing tea overboard, we are at risk of throwing this great nation overboard. The Tea Party has done us a favor by bringing these problems to the forefront; now we need them to act responsibly. Tea Party members, the party financed by Rupert Murdock, the Koch brothers and other super wealthy individuals, are correct; this country needs to get its fiscal house in order. We have lived beyond our sustainable means for more than a quarter-century and it is clear this must change. However, it is too important of an issue to address while under the self-imposed pressure of debating whether to raise the debt ceiling. We must raise the debt ceiling now because we have a legal and moral obligation to pay our debts and if we do not we will be the biggest losers. If the ceiling is not raised the country will default on its monetary obligations to its citizens, individuals of other countries and other sovereign nations. It is not realistic to think that there would be no worldwide ramifications to the United States failing to meet its financial obligations. This event would lower the countries standing in the eyes of the remainder of the world and reduce our ability to compete and influence fellow citizens of this planet. Our world will never be the same, as we know it. Our children will live in a country having less control of its own destiny and outside forces will be able to dictate our future. 1. How much revenue does the government need and/or should it get? 2. What can government do to raise the total income, the GDP, of the nation? 3. Should we raise the tax rates of the wealthy? 4. Can we/should we fix how income in this country is distributed between the wealthy, middle class and poor? The government needs to change how it budgets. We no longer can decide what we want to spend, figure out how much revenue will be coming in and borrow the rest. We must start with our expected revenues and then decide how we should best spend those revenues. There will be times when expenditures will be greater then revenues, such as wars or during an economic downturn. In these times, we will need to borrow, but only after much debate, consternation and with a plan as to how to repay the debt. 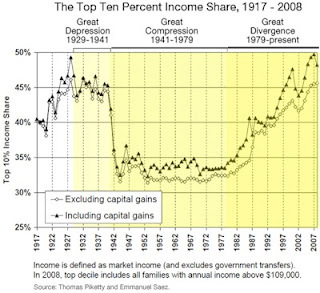 We would not be discussing whether to raise the tax rates of the wealthy if the distribution of income in this country were more in line with what it was historically as shown by the graph to the left.. According to the McKinsey Global Institute, giant Multi-National Companies (MNC's) accounted for 31% of our economic growth since 1990. Their quest for profit optimization and market control is no longer congruent with the interest of the "people". This is not the fault of the MNC's, but rather the fault of the government not being one of the people, by the people and for the people. “People of the same trade seldom meet together, even for merriment and diversion, but the conversation ends in a conspiracy against the public or in some contrivance to raise prices.” (Adam Smith, The Wealth of Nations, 1776). What many refer to as free markets, are not free. It is true they are not under public, government, control; however, a small group of very large corporations controls the power and wealth created in these markets. One result is the consolidation of wealth in this country, along with market power. Our government has the responsibility and authority to correct this inequity and abuse of power, but chooses to do nothing about it. It could enforce existing anti-trust laws to break up these oligopolies making these industries more competitive, creative and resulting in a fairer distribution of income amongst the citizens of this country. Why is the government not acting? The heads of these corporations are wise enough to buy off our elected officials with campaign contributions. This includes members of both parties including the President. Some members of congress have been quick to call for a constitutional amendment to require a balanced budget. I find it interesting that these congressional representatives are not simultaneously calling for an amendment to correct our out of control campaign financing laws. If this was corrected, everything else may take care of itself. Where is The Tea Party on this issue? Oh, I forgot; Rupert Murdock and the Koch brothers finance them. I appreciate your thoughtful comments and would like to reply. In many ways we agree. Government does impose needless regulations on business. Free Markets should be the primary determiner of how wealth is allocated. Everyone should have an equal shot at success. The major responsibility of government is to protect us from tyranny and that is why we have an army and a police force. Where we may disagree is I believe it is governments role to not only protect us from outside tyranny, but also from tyranny within. Some coporations and oligopolies have too much control over markets and it is governments role to protect us from this possibility. A Good example is AT&T trying to buy T-Mobile and control the cell phone market. Free markets need to be protected; otherwise, wealth and opportunity will be unfairly distributed. Government must take steps to assure its citizens that one company, or a small group of companies, cannot control a market where they set the price and quality of their products without regard to competition. This group of market participants, if allowed to do so, can also reduce the ability of our citizens to offer their labor services to the market at a fair wage because other companies do not exist to compete for their services. I appreciate you taking the time to share your thoughts. Free markets mean freedom from unnecessary regulation; and from private entities owning markets and destroying competition. Excellent comment, thanks. It would take major changes in the Washington power structure to make any headway on your suggestions. Neither of the current parties will do it -- lobbying and corporate campaign contributions have to be eliminated first. In Re: Primary blog-- You had me until the last paragraph. "Where is The Tea Party on this issue? Oh, I forgot; Rupert Murdock and the Koch brothers finance them." Well, you also started to lose me at the parts about "4. Can we/should we fix how income in this country is distributed between the wealthy, middle class and poor?" and "if the distribution of income in this country were more in line with what it was historically" and "a small group of very large corporations controls the power and wealth.... Our government has the responsibility and authority to correct this inequity and abuse of power, but chooses to do nothing about it." For a blog dedicated to "Free our Free Markets," this should be obvious nonsense. "4. Can we/should we fix how income in this country is distributed between the wealthy, middle class and poor?" Outside of government stepping in and interfering even more in the markets, what do you propose? Who knows, or rather, who shall decide what the "best" and "proper" distribution is? The mechanism to do what you seem to want is for government to take its thumb off the scale, leaving the individual to his own devices to move himself from "poor" to "wealthy," classifications you seem to believe are permanently applied to groups of people, as if they could never leave that group. The way you and government would approach your problem would be with the goal to make the "poor" group as small as possible, the "middle class" group as big as possible, and the "wealthy" group only big enough to pay all the taxes for the other two groups. A better way to look at it is to have a goal to make it as easy as possible for those in the "poor" group to move themselves at their own pace into the wealthier groups. Let them become wealthy by working for it, not by having it given it to them, taken from somebody else. "if the distribution of income in this country were more in line with what it was historically"
Do you mean like in the '20s? No, you mean the '40s through the '70s. But there is a lot more to that graph than the narrow interpretation you give it. The '20s, and the '80s to today are generally considered to be prosperous eras, while the economy was struggling along in the '50s through the '70s (the war makes the '40s non-comparable to anything at this level). Much of the non-urban American "poor" today live about as well in most respects as the middle-class did in the '50s. That's my assertion, based on experience and observation. Why do you think a different distribution would be better, and how do you propose to do anything about it outside of confiscation of private property? "a small group of very large corporations controls the power and wealth.... Our government has the responsibility and authority to correct this inequity and abuse of power, but chooses to do nothing about it." Well, gee, do you suppose that might have something to do with the fact that the government has created this "inequity and abuse of power" for its own purposes by interfering in the markets, picking winners and losers, favoring friends and handicapping those who stand up to it? Conspiracy theories make great fiction, but the biggest conspiracy, the biggest monopoly, is the Federal Government--it's no fiction, and reducing the size and thus the power and bullying influence of that government is a primary goal of the Tea Party movement.